The article derives from speculations in this blog over the past year. See posts tagged blockchain. Coyne, Richard, and Tolulope Onabolu. 2017. 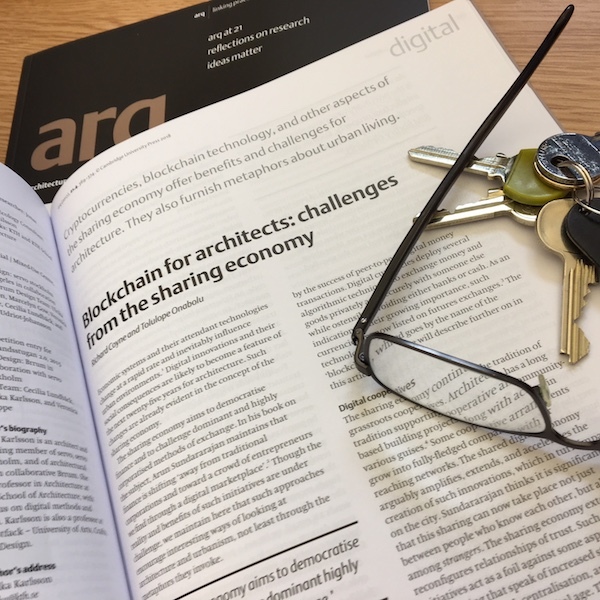 Blockchain for architects: Challenges from the sharing economy. Architectural Research Quarterly, (21) 4, 369-374. Publisher site. Open access version. The democratic idealism behind the sharing economy sounds impressive. I was reminded this week of how tech innovations often get wrapped up in egalitarian narratives. There’s a nice New York Times podcast and article about Mark Zuckerberg’s interrogation by the US Congress — in light of the dubious acquisition of personal Facebook data by Cambridge Analytica. Facebook has branded itself as a platform motivated by the social ideal of bringing people together. One of the House members (Congressman Billy Long) suggested that Facebook had its origins in 2003 as FaceMash, a College prank site that displayed students’ image files without their permission, so that others could rank them on the basis of appearance. The questioning suggested that Facebook at its core is about exploiting private personal data, which is of course now monetised for targeted advertising and even sold to others to exert political influence or any other purpose as yet undisclosed. I take it for granted that we need always to mistrust claims about the (innocent) grass-roots origins of tech developments. Whether the invention of social media or the sharing economy, very little that starts in the dorm, bedroom, garage or between small groups of consenting adults is entirely innocent. Barbaro, Michael 2018. Listen to ‘The Daily’: Questioning the Business of Facebook. 12 April. Available online: https://www.nytimes.com/2018/04/12/podcasts/the-daily/mark-zuckerberg-facebook-house-hearing.html (accessed 13 April 2018). Teachout, Zephyr. 2018. Mark Zuckerberg’s Facebook hearing was an utter sham. Guardian, 11 April. Available online: https://www.theguardian.com/commentisfree/2018/apr/11/mark-zuckerbergs-facebook-hearing-sham (accessed 13 April). The App shows where the nearest Birds is and its charge level. and then putting them back in places where they were most likely to be used. Interesting service, though the comments under the YouTube video seem less complementary.